At this point most people living in developed countries understand the difference between organic and conventional produce. Hopefully you're at least aware that eating organic is better for individual health as well as our environment, even if you're not sure exactly why. In a nutshell, the use of organic fertilizers and pest control results in safer, fresher and better-tasting food for you and your family. Organic agriculture does not harm farm workers, and helps maintain long-term stability and fertility of the soil. It is absolutely not necessary to use toxic chemicals in order to produce bountiful crops. In fact the opposite is true - the synthetic pesticides and herbicides used by big agra actually, in the long run, harm everything they touch. So why is Monsanto still in business? Why are we still dumping toxic chemicals on our food? It may seem like a mystery, but it really isn't. One way to stop big agra is... stop giving them your money! Don't buy oranges in the summer; oranges go in Christmas stockings. Asparagus is no good in October, but it's wonderful eaten in celebration of spring. What's good in October? Apples. Gorge yourself on tomatoes in summer and fall, but avoid buying them in winter and spring when they are bland-tasting and mealy in texture. Local organic farms, CSAs, delivery services, farmer's markets and health food stores usually don't even sell non-seasonal produce, although bigger health food chains do. Buying local, organic and seasonal means you aren't contributing to destructive agricultural practices and even better, you're eating in accord with your natural biorhythms. Out-of-season produce that's been harvested early and ripens while in transit from a faraway country never tastes as good as the stuff that's been grown nearby and is allowed to come into its own freshness naturally. “Farm to table” may seem trendy but it's here to stay. Because once you get used to eating food that's bursting with life force and flavor, you just can't go back. 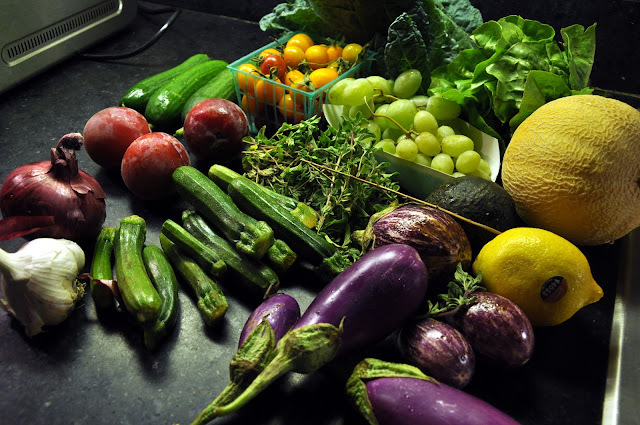 I've experimented with several CSAs and delivery services, and I'm fortunate to live in Southern California, where truly amazing produce is available year-round. For the moment I've settled on Summerland. They're based in downtown Los Angeles and they are the best I've tried so far in terms of quality, selection and price. Here's a photo from end of November 2012. Summerland does a fabulous job of curating each organic produce box. There is never too much of one fruit or vegetable (a common problem with regular CSAs - where you receive, say, 14 eggplants instead of three or four; 10 onions instead of one). Anyway, at the very least you can shop at a health food store, or in the organic produce section of your chain grocer. Be aware that use of the word “organic” is not particularly regulated or standardized. Lots of companies slap the word “organic” or “natural” on their labels solely for marketing, when there's nothing organic about the product at all. Question everything and be a smart consumer, and remember that advertising and marketing campaigns are mostly lies made up to scare you into buying this or that, or paying more than you need to. Mostly I eat fresh foods and consume very little from bags, cans or boxes, so I really only have to deal with the organic issue when I'm choosing produce. And I solve that mostly by eating what I get in my produce box, supplemented by trips to the farmer's market and occasionally a health food store. If you really need to eat that conventional produce, which ones are the best for you, and the worst? How do you deal with the higher cost of food when you're on a budget? Those will be the topics of my next post on organic produce. Namaste and thanks for reading!